Raizel Pekelis Esterson (granddaughter of Michael & Chana Stupak Ortenberg & great granddaughter of Moishe Leib Stupak) & Dave Kofsky (great grandson of Moishe Leib Stupak). 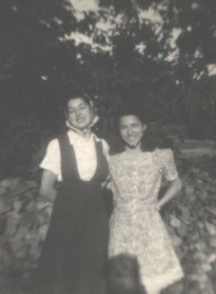 Esther Esterson Goldstein and Charlotte Ortenberg Huberman (3rd and 2nd great granddaughters of Fivish Ortenberg). 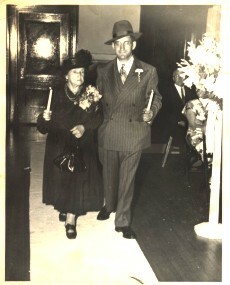 Tsirel Ortenberg Olin (granddaughter of Fivish Ortenberg) and her grandson Max Olin. Fanny Esterson Kugelmass (ABT 1940). (Much of the initial early Ortenberg and Stupak family history emanates from the Mitchell Michael Ortenberg (1917- 1998)'s research). Fivish Ortenberg (abt 1786- abt 1870) our earliest known Ortenberg ancestor and his sister Tsaitel were, we believe, born in Ruzhin, a Ukrainian town about 120 km south and slightly west of Kiyev (Kiev) where most of our Ortenbergs of Ukrainian origins were born. Fivish’s son Schachne was born sometime after 1820 and lived till about 1918. Schachne Ortenberg married Baila Raizel and after her death married Anna Etta (Chaya) Buchkovsky. A second marriage for both. Schachne and Baila Raizel’s Ortenberg’s children born in Ruzhin around the 1840-60 were Michael Ortenberg (my maternal 2nd great-grandfather), Tsirel Ortenberg and Aron Ortenberg. (Shachne's and Anna Etta's children and descendants are expanded upon the "The Berger's" below). Son, Michael Ortenberg married Chana Stupak my maternal 2nd great grandmother and their descendant history is expanded in “Chana Stupak’s and Michael Ortenberg’s Descendant’s” below. Daughter, Tsirel Ortenberg and her husband Pesach Olin and their child Yosel, migrated to Winnipeg Canada. Yosel married Rachel Naruzny and had eleven children (of which one twin daughter died as a child). Tsirel's many descendants are scattered wide and live amongst other locations in Winnipeg, Chicago, Ottawa, Minneapolis, Toronto, Israel and Washington D.C. Son, Aron Ortenberg was murdered in a pogrom Odessa where and his wife Goldie Cohen Ortenberg also died but their children Ben Zion (Benjamin), Ben- Zion and Michael immigrated via Montreal and Avrum directly to New York via Constantinople. Schachne and his second wife Anna Etta Buchkovsky (Chaya) (b. abt 1859 in Ruzhin) had six children Voveh, Fivish (Philip), David, Hyman Herman, Yale (Yalik) and Raizel Chana. The boys, save Voveh immigrated to the USA where they adopted the Berger name. Fivish (Philip) and David arrived first. Schachne died in 1918 and on September 25, 1921, Anna Etta Ortenberg arrived at Ellis Island with her widowed daughter Rose (Raizel) and grandchildren Minda, Saidie and Ilene Pogibitsky en route to her son David in Detroit. Yale as Yoel Ortenberg landed on Ellis Island on April 17, 1922 also en route to David. From the mid fifties contact between Schachne and Baila Raizel's descendants (“The Ortenbergs") and Schachne and Anna Etta's descendants (“The Bergers”) was lost. In 1998 thanks to Detroiter Barbara Moretsky and the U.S. Social Security Death Index, I located Rose Ortenberg, Yale Ortenberg Berger and David Ortenberg Berger's descendants. All contact has been lost with Voveh Ortenberg's descendants and I have yet to connect with descendants of Philip. Moishe Leib Stupak my 3rd great grandfather (b. Abt 1797 in Soloviyevka Ukraine) had five children Chana, David, Ettie Pinnie, Esther and Mendel. 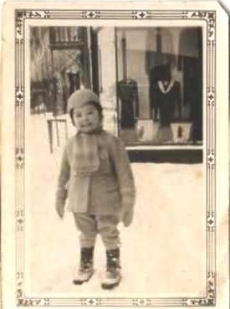 Moishe Stupak's son David, presumably for military reasons adopted the Ortenberg family name and moved to Suceava (part of the Austrian Empire from 1774 until November 1918 and Romania today) and migrated to Quebec City in 1892. 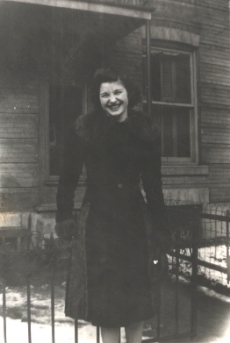 Ettie Pinnie Stupak Gitnick had four children some of whom migrated to North America. Esther Stupak married Velvel Gazinski and had six children and most of their descendants immigrated to Quebec City and Montreal. David (born Stupak) Ortenberg had five children of whom Ben Zion Ortenberg had a clothing store on St. Joseph St. corner St. Dominique in Quebec City. Ben Zion became famous in Quebec judicial history as a result of the 1910 Ortenberg vs. Plammondon Trial in which Quebec City Notary J. E. Plammondon who was promoting the boycott of Jewish businesses. Plammondon was taken to court by Ben Zion. Details of this trial and the events that preceded it are described on pages 67-69 and 157 of "Jews and French Quebecers" by Jacques Langlois & David Rome. (Published in 1991 by Wilfred Laurier University Press). Chana Stupak (b. circa 1841 in Soloviyevka) and Michael Ortenberg (b. circa 1847 in Ruzhin) were married in Ruzhin and lived in Ruzhin, Soloviyevka, and Brusilov. They had six children including Sura, Rachel, Fivish, Isaac Meir and Nathan. Michael Ortenberg died in Soloviyevka in about 1899 and Chana Stupak Ortenberg circa 1920 she migrated to Quebec City, Canada to join her sons Isaac (immigrated 1905) and Nathan (Nissin (immigrated 1907) and her brother David (Stupak) Ortenberg and his children. Chana died in Quebec City on January 18, 1926. 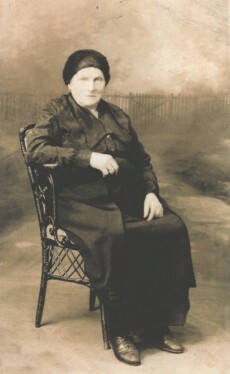 In about 1920, Sura Ortenberg Pekelis, my maternal great grandmother, by now a widow migrated to Quebec. I am uncertain if she immigrated with her mother Chana Stupak Ortenberg or before or after her. Three of Michael and Chana Ortenberg's children including Fivish (b. Abt 1868) stayed in the Ukraine. Fivish married Chaya Sura Alpert of Radomyshl and had ten children many of whom immigrated to North America and one to Mexico. Fivish's son Aron Ortenberg (b. abt 1909) stayed in Kiev, maintained relations with his North American family and moved to Jerusalem Israel in 1992. Quebec City was Stupak and Ortenberg way station for a few months or a number of years from the early 1890's. A number of family members, including my second great grandmother Chana Ortenberg, are buried in the Beth Israel Cemetery in Quebec City. By the 1950's all surviving Ortenberg and Stupak descendants had moved to Montreal or elsewhere in North America. The journey from Quebec to Montreal was sometimes via other Quebec Cities. Nathan Ortenberg lived in Donnacona for a number of years and a Shloime Pekelis came to Montreal after living in the northwestern Quebec town of Rouyn. Sura Ortenberg, (Michael Ortenberg and Chana Shtupak's eldest child) married Moishe Leib Pekelis (abt 1863-1913) who died in the Ukraine about seven years before Sura migrated to Quebec City. Four of their six children, Pearl Pekelis Ilovitch, Shloime, Srulik and Raizel Pekelis Esterson also immigrated to Canada. Of the two children of Sura and Moishe Leib Pekelis's who remained in the Ukraine Aron disappeared in World War One and Velvel perished in the Urals in 1943. Most of Velvel's grandchildren and great-grandchildren immigrated to Israel in the 1990 wave of Soviet immigration to Israel. There are further details in the alphabetically sorted reports and the "on line" family tree accessible through the Familytreemaker link.